The Korean Golf Queen did it again. SYLVANIA, Ohio – Morgan Pressel’s hole-in-one sure got Se Ri Pak’s attention. Trailing briefly by three strokes after Pressel aced the sixth hole, Pak regained the lead with a birdie at the 15th hole and held on to tie an LPGA record with her fifth win at the Jamie Farr Owens Corning Classic on Sunday. 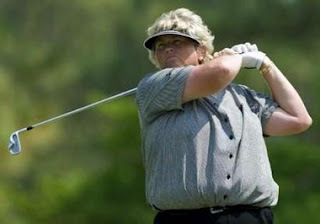 Pak, who previously won the Farr in 1998, 1999, 2001 and 2003, matched Mickey Wright, who won the Sea Island Open in 1957-58, ’60, ’62-’63, and Annika Sorenstam, who has won both the Samsung World Championship and Mizuno Classic tournaments five times each. The 29-year-old Pak, who has already qualified for induction to the Hall of Fame, has 24 career victories. She followed rounds of 63, 68 and 69 with a 67 to finish at 17-under 267 and collect the $195,000 winner’s check. Pressel closed with a 69 and was three shots back at 270. Pak and Pressel dueled all day until Pak finally broke a tie at the par-4 15th, almost holing an iron approach which ended up 2 feet from the cup. After Pressel’s long putt from the back fringe came up a foot short, Pak rammed in the birdie to go ahead by a stroke with three holes left. Pressel’s approach at the 17th braked to a stop 2 feet away. But Pak rolled in a 6-footer for birdie before Pressel tapped in, maintaining her advantage. At the 18th â€” the second of back-to-back par-5 closing holes at Highland Meadows Golf Club â€” Pak created a roar from the large gallery when she came within inches of holing her approach. Her tap-in birdie putt clinched the victory. After her ace, Pressel was even par the rest of the way while Pak was 6 under. The final round was like match play or a playoff. Se Ri in addition to her incredible record at the Farr, is 5-0 lifetime in playoffs. She beat Morgan, but it was much closer than the three-shot win that the leader board registered at the end. Prediction- Se Ri Pak will win the Jamie Farr Classic again. Anyone want to wager $50 she doesn’t? ESPN televised the tournament’s 2nd, 3rd and 4th rounds. When Se Ri and Morgan began walking down the 18th fairway after their tee shots on Sunday, the broadcast was interrupted for some five minutes. When ESPN2 returned, they said there were technical difficulties. An announcer misnaming Laura Diaz, Laura Davies instead. Look at the pictures to the left and above, do these two women look anything alike? Davies is on the right. Someone get an optometrist to Toledo Stat! It had to be a slip of the tongue. I hope. Charlie Rymer being amazed by Jin Young Pak being paired with Se Ri on Saturday. Pro golf tournaments are paired by scores after the cut was made. Pak and Pak were 1-2 and that meant they were paired. Rymer has been broadcating golf for over ten years. He should know better. ESPN showing Se Ri’s impressive record at the Farr, but saying she had made the cut nine times in nine tries. That is incorrect, Se Ri played the Farr in 1997(before she joined the LPGA). She missed the cut.